Anything Is Possible In Australia! This utility allows you to perform a range of tests on web and DAV servers to check their functionality. The currently supported checks are: HEAD, OPTIONS, PROPFIND, REPORT and SEARCH (in custom query only) and you can now specify your own custom query. NB: Only HTTP and HTTPS protocols are supported and you MUST specify the protocol in the URL field. Only "Basic" and "Digest" authentication are supported. If you want to provide authentication then you must tick the "Enable Authentication" check box. If you cancel a custom query the extension will perform an OPTIONS query instead. The SEARCH query is only available as a custom query and the "Depth" option is ignored as the depth should be specified as part of the query. 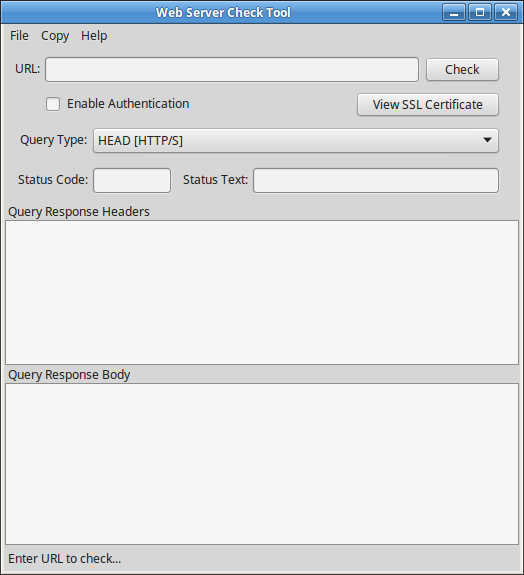 SSL certificate errors are ignored unless they cause a connection failure. You can see the certificate details by clicking on the "View SSL Certificate" button. This software is available for use under an End-User License Agreement that you are required to abide by. If you feel that this agreement is unreasonable do not make use of this product. The following components are released under their own licenses. If you like this software then, please, make a donation. Thank you.